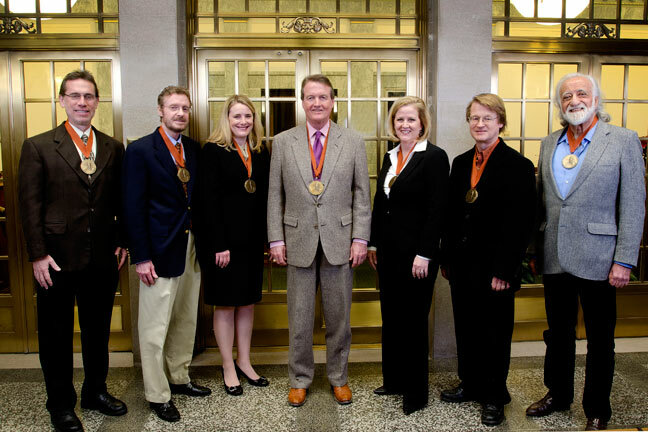 On December 8, 2011, ESI Director Dr. Jay Banner was inducted into The University of Texas at Austin’s Academy of Distinguished Teachers. 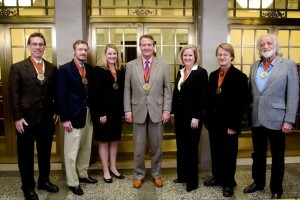 The 2011 inductees bring the the Academy’s membership just 126 members – roughly 5% of the tenured faculty at the university. Members of the Academy provide leadership in improving the quality and depth of the undergraduate experience by advising the president and provost on matters related to the university’s instructional mission; participate in seminars, colloquia, and workshops on teaching effectiveness; and serve as mentors to new faculty. Dr. Banner will undoubtedly be a strong addition to the academy, having exhibited this leadership and commitment throughout his career. For example, Dr. Banner helped lead the university-wide effort in curriculum reform that brought signature courses to UT, connecting student interests with faculty expertise. And together with Dr. David Allen (Engineering), Dr. Banner has co-taught Sustaining a Planet for the past six years. Dr. Banner’s teaching has also been recognized by his students, and in 2011 he was the recipient of the Friar Society‘s Centennial Teaching Fellowship for his work in Sustaining a Planet, the university’s largest undergraduate teaching honor. More recently, Dr. Banner demonstrated his commitment to undergraduate education by helping develop of the new undergraduate degree program in environmental science. The degree program was approved by the Texas Higher Education Coordinating Board last fall, and this December the program graduated its first two students. Like the Academy to which he was just inducted, Dr. Banner and ESI are emblematic of the university’s commitment to excellence in teaching and education, and ESI looks forward to demonstrating that commitment in years to come!